What a Difference in 48 Hours! "When I get poison ivy, I get it really bad. I have had prednisone shots in the past and it cures it really fast. However, I was determined not to get any more shots due to the side effects. I had poison ivy for 12 days when I found you guys on the internet and decided to get your product a try. 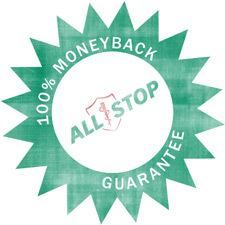 I ordered the All Stop and had it shipped overnight, and since I had it for 12 days, it took about a few days to really see the difference. I felt the difference in my itching in about 48 hours. A great product and I will be buying more of this product and telling all my family and friends." "Within days, the rash and swelling were completely gone. I purchased your product about 1 month ago. I am severely allergic to poison ivy. I have tried almost everything, when my last hope was All Stop . I decided to give it a try. With a money back guarantee, I thought, "What could it hurt? I received your product when my left arm was totally inflamed and swollen. My right arm was bad also, but not as bad as my left. I had always dealt with the poison ivy for 3 weeks before I would get relief. Once I received your product, I applied it several times a day. Within days, the rash and swelling were completely gone. A day or so after, another rash appeared almost in the same spot as the prior rash. I called in and talked to someone about the issue; they informed me that rashes can break out up to 10 days after exposure, and to continue to use the product for a few more days and see if the rash continues. I followed her advice and the rash did go away with no further outbreaks. I am happy to have a product I could finally rely on for future outbreaks." "After a couple of weeks, my husband became infected with poison ivy behind his knees. I told him to use the left over product. At first, he said it didn't seem like it was working. Within a couple of days, the rash was gone. However, now the initial outbreak has spread, covering most of his body. He is continuing to use the product but it is quickly depleting. That is why we have decided to purchase a new bottle. I will keep you posted to let you know how it turns out. So far we are very pleased to have purchased something that will work quickly and efficiently."